Hells Light hoped back into DC Universe for his second outing. 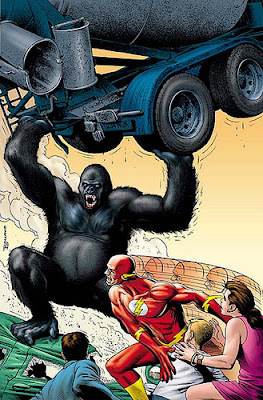 This time I matched wits with Gorilla Grodd’s forces as they tried to de-evolve humans; well, not so much a “matching of wits”, as it was me placing my fist right on his sloped forehead. This was my first taste of fighting actual villains from the DC canon. So it was cool to fight Gorilla Grodd in the end, with the help of the Flash. Together we sent Grodd back to whatever dimension, portal or world he can came from. It’s fun to have DC hero’s battle alongside of you during quests. That’s what DC Universe Online is all about. I continued on to fight the HIVE forces, and then help Wonder Woman’s Amazonian friends. Really all the quests in DCUO center around combat with cameos from various DC villains and heroes to spice things up. Endless fighting is starting to get a bit repetitive, but that was to be expected…just not so quickly. I think using a controller may cure me of this constant mouse clicking that is putting serious strain on my wrists. I’m just not used to mashing buttons on a keyboard as well. I forget where my various powers are sometimes, and find myself repositioning my hands on the WASD keys constantly. The auto-target system—during combat, may feel more natural with a controller too, with a keyboard, not so much. As of right now I’m trying to spec my character into becoming a Tank, since I am just starting actually becoming a true Tank isn’t quite an option. I’m just kind of spending points wherever I want. “Fireballs that fall from the sky”, that sounds cool! That’s as much thought as I put into picking traits and abilities. I’m playing on a PVP server so I have run into the level 30 villains who like to thrash unsuspecting low-level characters who are questing. But I chose to play on a PVP server for a reason. I wanted that extra feeling of unease that you get from realizing that all isn’t safe, no matter where you are. I haven’t tried any of the PVP combat arenas, nor have I done any group questing. So I’m looking forward to diving into those soon. The art of “grinding” in order to level up seems to be a nonissue in DC Universe. Which is welcomed. Especially coming off the absolute grind-fest that was the MMO Aion. In DC Universe you just hope from quest to quest. There isn’t even a need to return to the original quest giver, in most cases you can just click complete and you’re done. Most missions have a nice pace, and you don’t need to stay in any one area too long, constantly killing the same enemy’s over and over like most MMO’s. As of writing this I am level 12 and climbing fast. That’s only about 7 hours of play and I’m nearly half way to 30, where I’m told most of the action really takes place. That is where DC Universe Online is similar to most MMO’s, in which the best content is saved for the higher-level characters. That’s fine it gives people something to strive for. Still I’ve enjoyed most of what DCUO has to offer. The combat seems like it would be more inviting to me if I had a controller, and quests are still pretty simplistic. Yet like I mentioned before I just like being in this world. To live in the same world as my favorite comic heroes and villains is all I’m really asking for. In that regard DC Universe delivers.